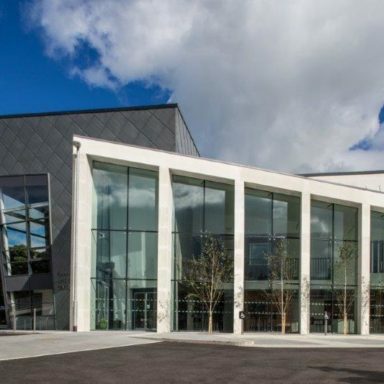 Irish President Michael D. Higgins officially opened the brand new Tommy Makem Arts & Community Centre in Keady, Co. Armagh on Wednesday 16th September 2015 showcasing the innovative, modern, multi-purpose facility which commemorates the life and times of the internationally-celebrated Irish folk musician. The state-of-the-art project comprises a spacious, multi-functional hall with additional flexible rooms and spaces available for use by the whole community, including a studio, an outdoor play area, an exhibition centre and fully equipped kitchens. The musician, artist, poet and storyteller died in 2007 and was probably best known for his famous singing partnership with The Clancy Brothers – The Clancy Brothers and Tommy Makem – while being internationally-acclaimed for his skill and natural musical ability with several instruments, including the banjo, tin whistle, low whistle, guitar, bodhrán and bagpipes, while singing in a distinctive baritone. The new centre has proved to be an extremely beneficial facility for the whole community and currently hosts a range of programmes from hip hop dance for children, Irish dancing, jiving classes, line dancing, yoga, indoor bowling, scouts, sewing & crafts as well as a wide programme of events for pensioners. There is also an Afterschool Club on site, catering for up to 24 children between the hours of 2-6pm Monday to Friday. There is also a cinema screen installed in the Main Hall and regular cinema evenings have been organised for groups across the board, from youth groups through to the pensioner groups in the area.